In amongst the many current and ex-footballers on twitter, you really have to sort out the good from the bad to decide who is worth following. 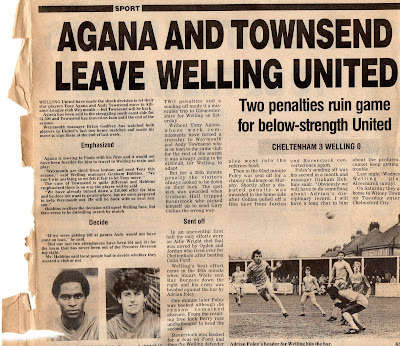 For most #twitterblades there was much excitement when former player Tony Agana was found on twitter. For me (and may Blades fans of my age) he is one of several people to represent a halcyon period of my Blades supporting life. 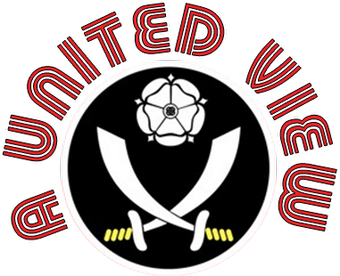 Between the ages of 13 and 19 I saw United achieve two successive promotions, returning to the top flight for the first time in 14 years, achieving the Sheffield Double and staying in the top flight until the Great Escapes finally ended in 1994. Tony was an integral part of it; although he had moved on by the time the Blades were relegated from the Premier League on the last day of the season at Stamford Bridge. Tony uses twitter in a really positive way, engaging with supporters, answering their questions, whilst also promoting Sheffield and supporting the local business community, of which he is a part. After he kindly re-tweeted a blog post of mine, my thanks were responded too with a message of "Great blog BTW" and I took that as my cue to ask Tony if he would be willing to be interviewed for it. And that is how I find myself spending an engaging and entertaining 90 minutes in the company of Tony. In a hotel adjacent to the pitch where he used to entertain and score in other entertaining 90 minute spells some 20 years ago. We talk about his football career, from playing for Welling United and selling fruit on a farm, to promotions with United and then relegation from the league with Hereford United. Parts 2 and 3 will follow over the next couple of nights, but we start at the beginning of his career and I started by asking Tony about his early career and the combination of playing football alongside a full-time job. 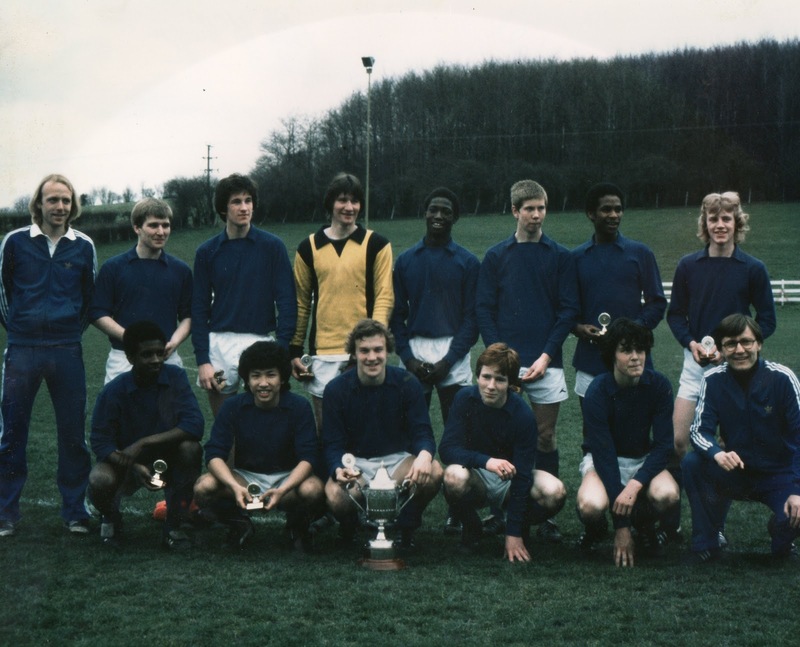 Were there any other lads in that Orpington/Welling side that went on to a league career? “At the same time I had left school and continued where a summer job had finished; on a Pick-Your-Own Farm Shop. Out in the country but most of it came from Borough Market, customers seeing the oranges and grapefruits and saying “Ooh where did you grow these? !” After about 6 months my Mum said get a proper job, so I got a job with an Insurance company in the City of London. 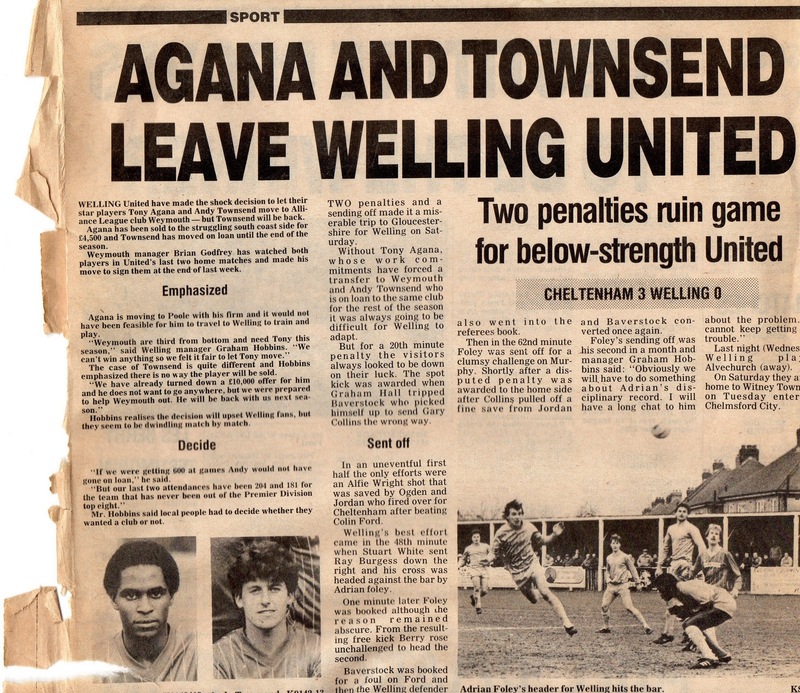 In the end it was the job that led to me leaving Welling." "The company I worked for was cost cutting and decided to relocate operations to Poole in Dorset. Many took redundancy, so in order to keep continuity of staff they were offering generous relocation packages and for a young guy to be given the chance of a 1% mortgage on his own house, it was a no-brainer. So Welling invited representatives from Poole, Weymouth and other South coast clubs to come and watch me to try and set up a deal. 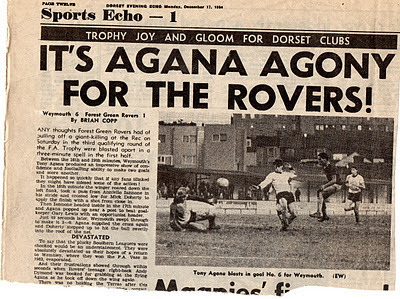 The then Weymouth manager Brian Godfrey (ex-Aston Villa and Wales) saw me and said to the chairman, “He’s not bad that Agana, I'll give you a grand for him, but I also like your midfielder”. 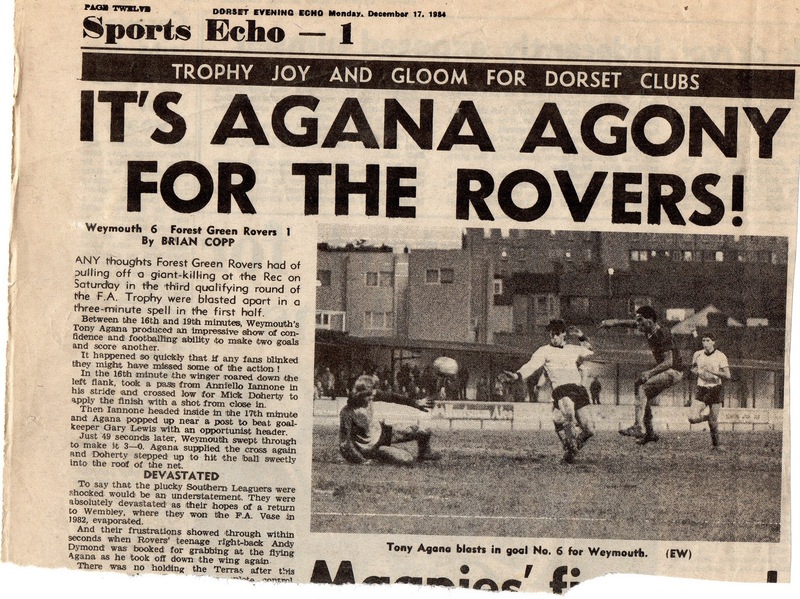 Brian offered a five figure sum that also got Weymouth Andy Townsend as well!" "Weymouth was good for me and for a while living in Poole was good fun. There was great camaraderie amongst a group of us who travelled from Poole for each game. The balance was great; once you have finished work what else are you going to do on a Saturday. If you asked me where I enjoyed football to the max, it was at Sheffield United and in those non-league days." "However, after a while, I wanted to move back to London. 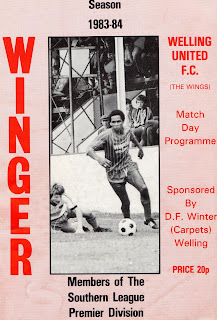 Stuart Morgan had taken over as manager and he was so different from Brian Godfrey and in the end I was glad to leave. In January 1987 I sold my house in Poole and spent the time until the summer living in Bournemouth." So how did the approach from Watford come about? It was a big leap from the Conference to the then First Division. "Well at first I thought it was a joke. I knew I was doing alright, but I wasn't expecting a call from Dave Bassett. He called and said I have just taken over at Watford; I’d like you to come on trial. It took two or three conversations to convince me it was really happening and it definitely was Harry Bassett. I was 23 and a Division 1 club are showing an interest it was like a joke. He asked me to go on their pre-season tour so he could take a look at me and in the end I thought, what can I lose? I am getting a free holiday, I’ve never been to Scandinavia and if it doesn’t work out I’ll look for a job and look to sign for Enfield or similar." 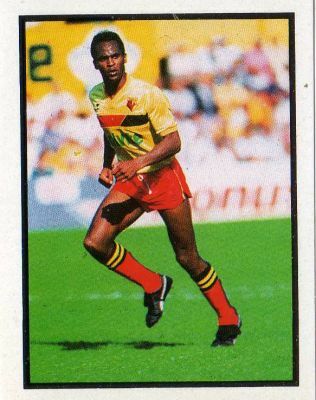 "There was Luther Blissett, Kenny Jackett, Tony Coton some big name Watford players, but because I had a relaxed attitude about the trial that helped me to do well on the pre-season tour and on the coach back from the airport Dave Bassett offered me a contract. He said go home for the weekend to think about it, although in hindsight I should have said yes there and then because I found out on the Monday that the team had all been to a barbecue at Elton John's house that weekend. You don't get that kind of opportunity very often. Gutted!" So how did you adjust to full-time professional football? "It wasn’t easy at all. The relaxed attitude of the pre-season tour disappeared; it’s now your living. It was quite difficult, but I was determined to have fun doing it. 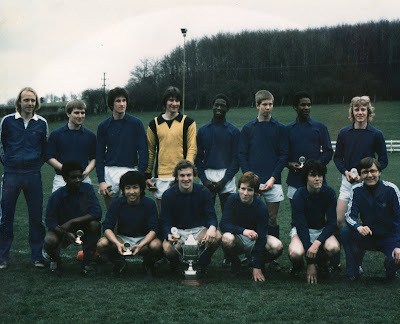 I worked hard and trained hard, but didn't expect to make the first team straight away, but four days before the start of the season Dave Bassett told me I was playing on the Saturday. Err....am I? There was huge pressure on me as I was stepping into the number 11 shirt vacated by John Barnes, but on my debut I got Man of the Match against Wimbledon." It was a turbulent spell at Watford, post Graham Taylor and I know Bassett found it difficult, how was it for you as a player and one of Bassett's signings? "Graham Taylor's methods conditioned players to play in a certain way. It was all very much pre-planned, but Harry gave the players a free reign. It didn't always work and the players used to playing Taylor's way found it difficult to adapt." When Bassett was sacked in the January after he had taken over, how difficult was it for you? "Very difficult. Steve Harrison had taken over. He had been there before, under Graham Taylor, he knew about the players and I perhaps wasn't his type of player....which is fine. Management is all about opinions. You live or die by your opinion of a particular player." In Dave Bassett's autobiography he mentions how Steve Harrison tried selling you to AFC Bournemouth? "Yes, I had taken in a mortgage application form for him to sign and he tells me “I wouldn’t bother signing it son”, a deal had been agreed with Bournemouth. That was the first I had heard about it." But Harry soon got back in touch though? "Harry being the loyal person that he was came back for me and it wasn't just me. If you look at who he went back to Watford for, it was a bit like "I'm not going to leave you there...I'll do my best to get you out of there." That one act...how much loyalty would you get for that? In a cynical world where everyone is out for themselves, how good does that make you feel as a player? He knew we would thrive under him rather than where we were. I believe that he also got players out to other clubs, through his network, if he couldn’t take them to United"
"It was more due to the situation certain players found themselves in, not fitting in, and nothing to do with the club. I have no bad feelings towards Watford and I have lots of friends there. I have huge respect for what they have achieved since, both on and off the pitch." “He persuaded me to come and have a look at United. I was a typical Londoner; going to Bournemouth was unheard of, to go up North was like...sheesh. Why would you unless you really had to? 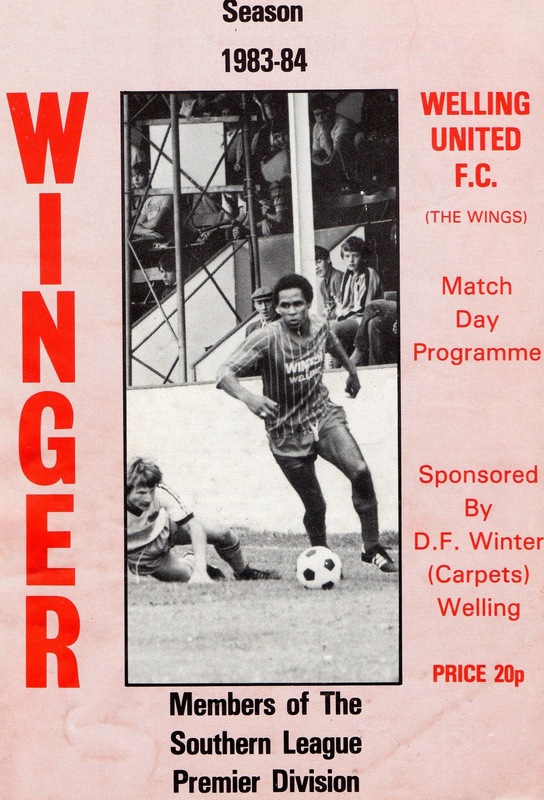 I had big doubts but he got me in a car and Harry had arranged for his former manager and mentor at Walton and Wimbledon, Allen Batsford, to drive me up with Alan Gillett another of his coaches. They were clearly trying to work on me and persuade me that it was the right move, but they made a fatal error of leaving the M1 at Junction 29. Through Chesterfield – it wasn’t pretty in those days - and through all the back roads to Sheffield I was like - "No. This isn't good. It's not for me". It wasn't pretty at all." "What really swung it was turning on to Cherry Street and seeing the stadium……BANG!...Bramall Lane….Oh My God…Where do I sign? Seriously that was it. That's not to say that Watford wasn't a good set up, but in size and with the South Stand in front of me it was just - wow!" "Inside the ground I met with Harry and Derek Dooley. Derek said all the right things, we want you here etcetera, but really it didn't matter by then. From the moment I had turned the corner in the car I had been sold." In Part 2, which you can now read here, Tony talks about successive promotions and some happy times at Bramall Lane. Good stuff !! Tony was a great player for Weymouth - not a bad signing with Andy Townsend who went onto better things as Alfie Moon in Eastenders 8-). Not a bad pair of players for a non league side!